Invertase (b-fructofuranosidase, EC 3.2.1.26) is an enzyme that catalyzes the hydrolysis of sucrose to fructose and glucose. Invertases cleave at the O-C(fructose) bond, whereas a related enzyme sucrase (EC 3.2.1.48) cleaves at the O-C(glucose) bond. A wide range of microorganisms produce invertase and can, thus, utilize sucrose as a nutrient. Invertase assay finds wide applications in environmental (e.g. soil), agricultural and food (confectionery) industry. 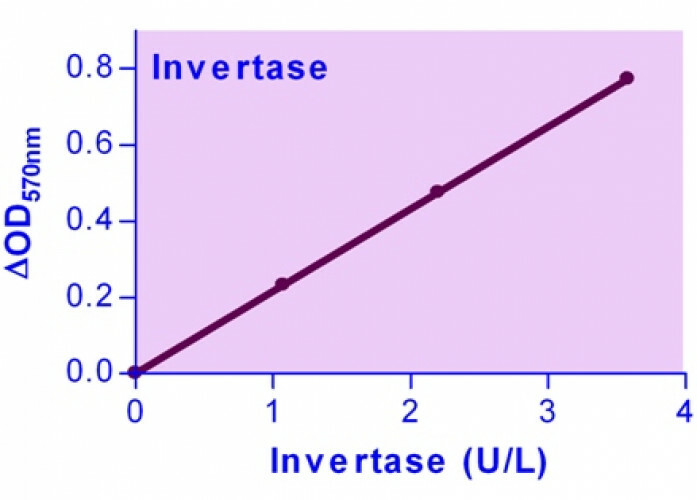 BioAssay Systems’ Invertase Assay Kit provides a convenient and ultra-sensitive colorimetric and fluorimetric means to measure invertase activity. In the assay, invertase cleaves sucrose, resulting in the formation of fructose and glucose, which is determined by a colorimetric (570nm) or fluorimetric method (λex/em = 530/585nm). The assay is simple, sensitive, stable and high-throughput adaptable. 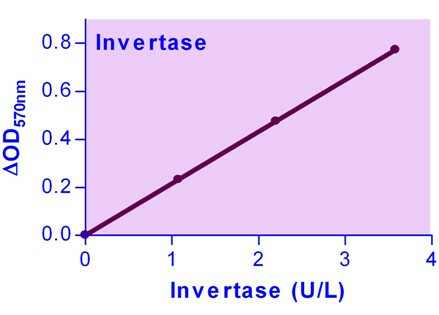 Applications For quantitative determination of invertase/sucrase activity. References Assay: Invertase/Sucrase in Honey (Pubmed).